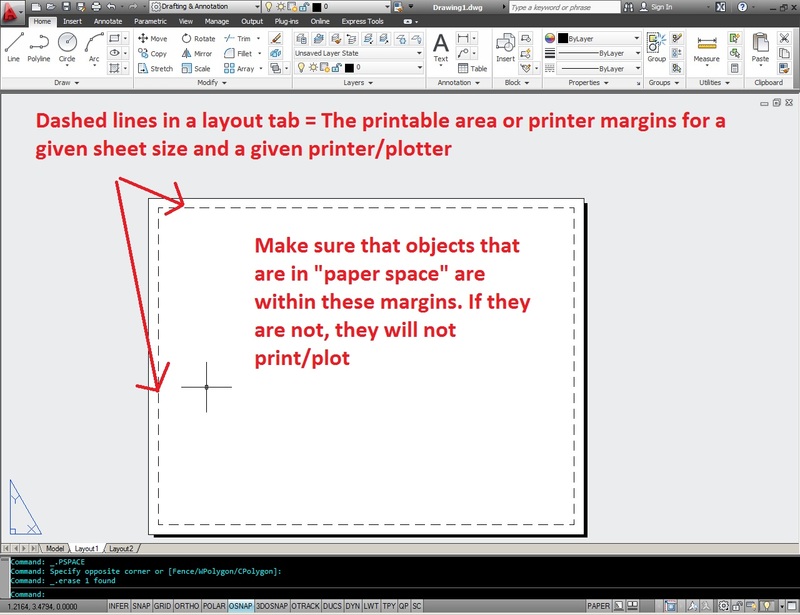 Simplified answer: These are the boundary lines that show you the printable area of that Layout Tab’s sheet size and printer/plotter settings. Depending on what printer and page size you have selected, these margins will change. This entry was posted in BASICS, Layout, Settling In. Bookmark the permalink. The margins can’t be modified. these are determined by the printer/plotter. I have 2 suggestions: 1) I would suggest adjusting your title block to fit within the printable area or 2) use the option to print to the PDF printer or “full bleed” as these tend to have more room on a page. In the case of “full bleed,” the entire page is available… Although, I have noticed that not all instances of AutoCAD have a “full bleed” option to choose. I will look into how to set up the “full bleed” option. I am woundering have you found out why some instances of AutoCAD have not got the “full bleed” option and how to fix it as I am having difficulty figuring it out. Didn’t know about “full bleed” option, very useful. Thank you!